Praised in the Wall Street Journal as a most mature and sensitive pianist and named one of the up-and-coming talents in classical music by Musical America, Chinese-born Di Wu continues to enhance her reputation as an elegant and powerful musician. Her concerts have taken her across the globe, charming audiences from East to West with her charisma, steely technique, and keen musical intelligence (Philadelphia Inquirer) and her fire and authority (Washington Post). 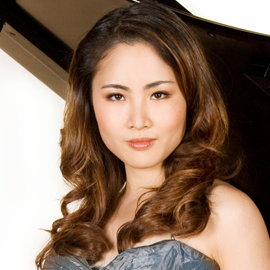 Now based in the United States, Di Wu made her Philadelphia Orchestra debut with Charles Dutoit in 2009. During 2010-11, she returned for another Philadelphia engagement, this time under the baton of Christoph Eschenbach. Ms. Wus current American itinerary is highlighted by yet another Philadelphia appearance  a recital presented by that citys distinguished Chamber Music Society  and once again comprises debuts and re-engagements as recitalist and soloist with orchestra on both coasts and numerous cities in between. Di Wu made her professional debut at the age of 14 with the Beijing Philharmonic, and has since appeared with orchestras such as Cincinnati Symphony Orchestra, National Symphony Orchestra, New Jersey Symphony, Pittsburgh Symphony, Hamburg Philharmoniker, Shanghai Symphony Orchestra, and Singapore Symphony Orchestra, to name a few. In addition to orchestra engagements, Ms. Wu is also sought after as a recitalist. In New York, she made debuts at Carnegie Hall and Alice Tully Hall at Lincoln Center, and has also appeared in such music centers as Chicago, Houston, Los Angeles and San Francisco, as well as at the Ravinia Festival and the Portland Piano Festival. Winner of multiple awards including a coveted prize at the 2009 Van Cliburn Competition; The Juilliard Schools Petschek Award; The Virtuosi Prize at Lisbons prestigious Vendome Competition; and the winner of Astral Artists 2007 National Auditions, Ms. Wu came to the United States in 1999 to study at the Manhattan School of Music with Zenon Fishbein. From 2000 to 2005 she studied at The Curtis Institute with Gary Graffman, subsequently earning a Master of Music degree at Juilliard under Yoheved Kaplinsky, and an Artist Diploma under the guidance of Joseph Kalichstein and Robert McDonald.